Apple's stock continues its strong recent performance, hitting another milestone today with a market capitalization of $700 billion and once again setting a new standard as the highest market cap in history before pulling back slightly. The mark comes less than two weeks after Apple's market cap passed $660 billion to set its first new high in two years. The company's market capitalization has doubled since Tim Cook was named CEO in August 2011. Apple's stock is up nearly 60 percent over the past year and up 24 percent since the company's October 16 media event, which was followed just days later by a strong earnings report. Looking forward, Apple is expected to show blockbuster iPhone sales for the holiday quarter, and Wall Street is anticipating continued strong performance into 2015 as Apple looks to add yet another product category to its mix with the Apple Watch. While Apple has been routinely setting new stock price highs for months, the new standards for market capitalization have not come until more recently, as the company's aggressive stock buyback program has reduced the number of shares available on the market. With market capitalization calculated as the share price multiplied by the number of shares outstanding, the share price has had to reach higher levels to make up for the lower number of shares. Apple's current share price of just under $120 is equivalent to nearly $835 on a pre-split basis. The stock market is crazy. It's not like any of the "problems" you just mentioned matter to investors, only to geeks like ourselves. None of which have any effect on the company's financial performance, except for the iPhone thing... but I'm not sure where you're even getting that from. What a silly list. Take any company, and you could post a list just like this of their recent failures. By the way, you're really reaching for stuff to complain about. not enough iPhones is a big reason why the stock is soaring. You sound like the competitors are perfect (which is not the case). not satisfaction levels of people in forums. 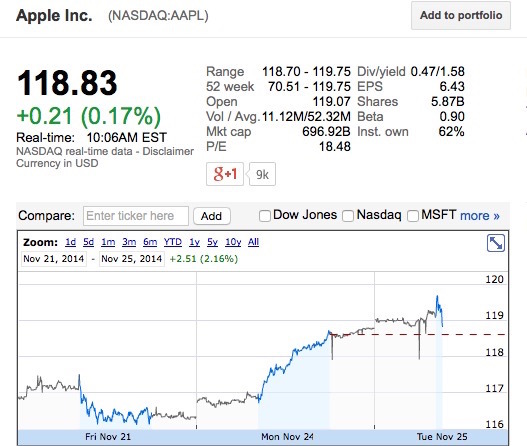 Judging from iPhone 6 sales, the stock market is perfectly sane. Looks like the naysayers were wrong.